At the beginning of the year I decided to make a list of 50 games I’d like to make sure I played this year – about one per week. 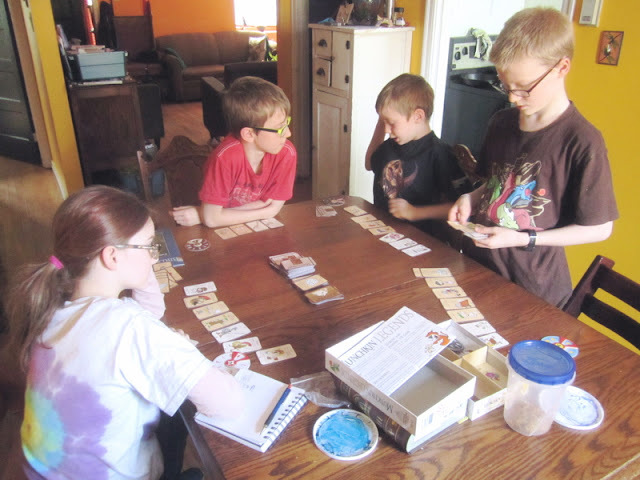 I tried to encourage the kids to do the same – so we’d ALL get to play at least 50 games we wanted to. I’ve even encouraged Amanda to pick at least one game each month – she enjoys playing with us, but couldn’t really be bothered to pick out a game each week (that would also mean finding time for FOUR boardgames each week…). 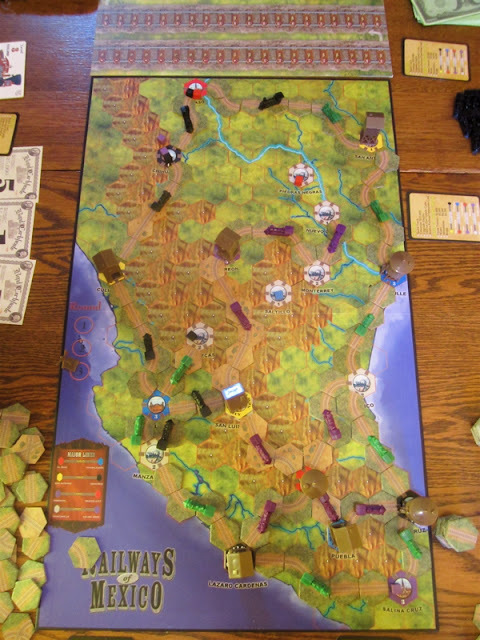 Last month I posted a January Boardgame Round up. For a full list of the 50 games for this year, check out the Game Plan 2017. Illuminati (which I haven’t played in YEARS – probably even a decade! or MORE!). 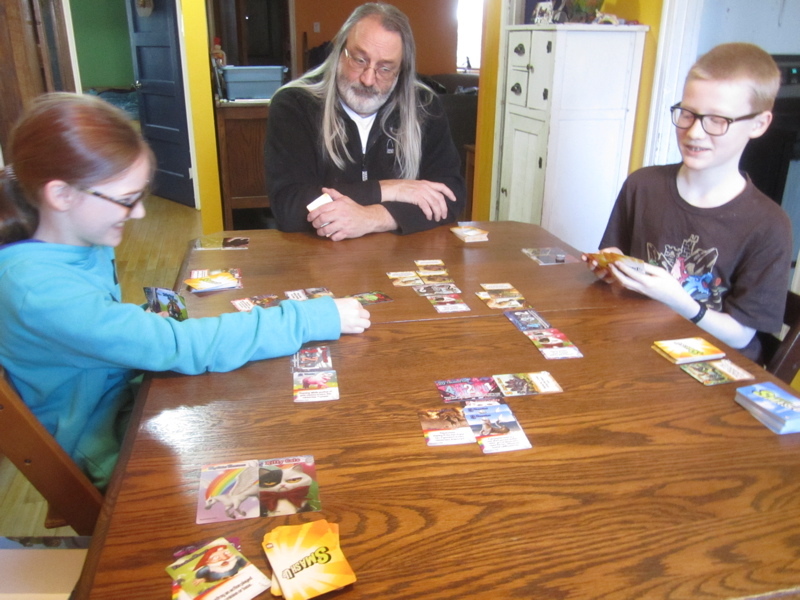 We kicked off this month’s picks with a game of Smash Up with our firend Bruce. (one of The Girl’s picks). I can’t remember how it went down. I think I had kitties and ponies…. This was fun enough when I first got it, but I have to admit, I've grown rather tired of it. Saturday (4 February 2017) Finnegan and I had planned to play A Study in Emerald (Second Edition) in the afternoon with some friends, but then no one was able to show up. So we ended up playing it in the evening when The Girl got back from dance classes and Amanda was out… or.. busy…? This game is funner with five players - and everyone is having to guess who is on which side - and you know that at least ONE other person is on your side! 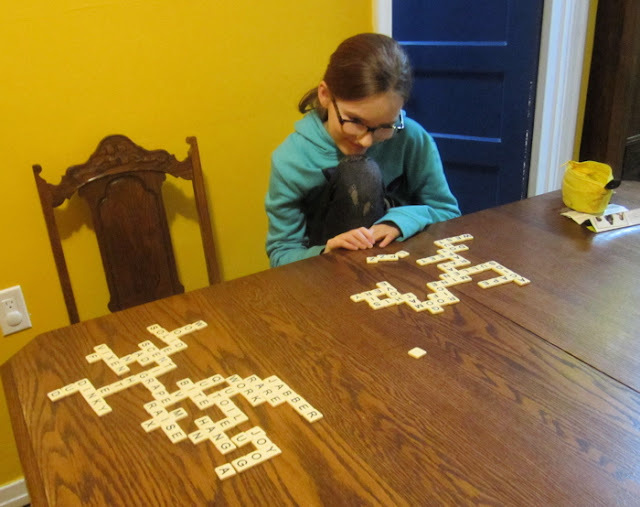 Sunday (5 February 2017) we got in a game of Linkage - another of The Girl’s picks. 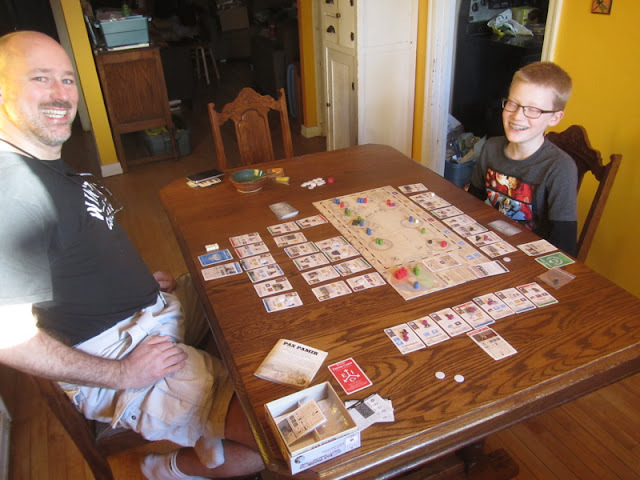 On Wednesday, 8 February 2017, the kids and I played a game of Railways of Mexico. I had not played on the Mexico map before. I thought it might be a bit daunting – all those MOUNTAINS! I’d heard from a friend that played and people had wracked up so much debt trying to drive rail lines through those mountains that they ended up taking bonds just to service their debt! I also thought it might be a longer game. It turned out to be neither a long game of a bank breaking game. I thought it was really fun and relatively quick. The map is smaller than the Railways of the Eastern U.S. and the cities aren’t terribly far apart. There were lots of quick little coastal lines that could be built. We actually ended up with a continuous rail line that went right around the country in a bit circle. 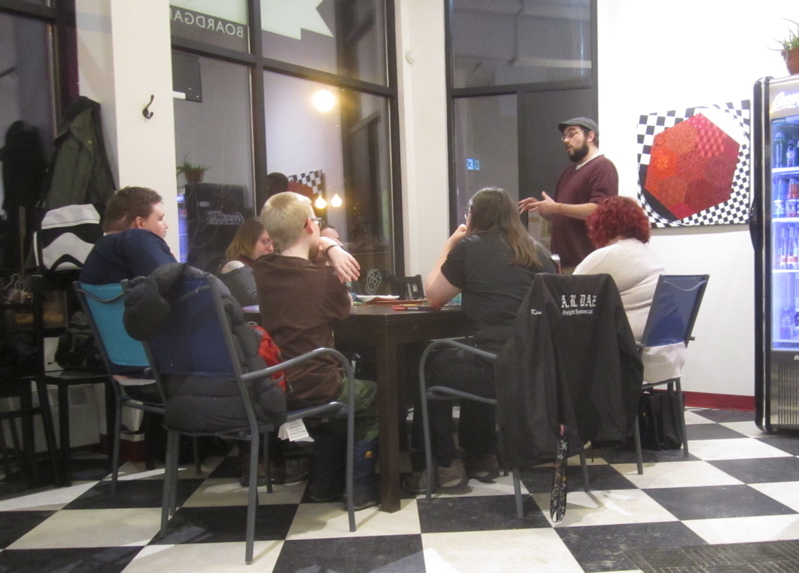 Friday, 10 February was our biweekly D&D night. 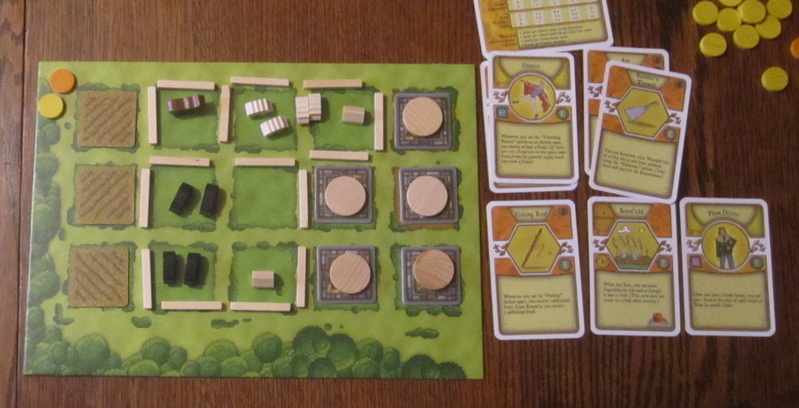 Not really a board game, but it’s gaming… and it ends up on my BGG Games Played Calendar, so… I though I’d mention it. 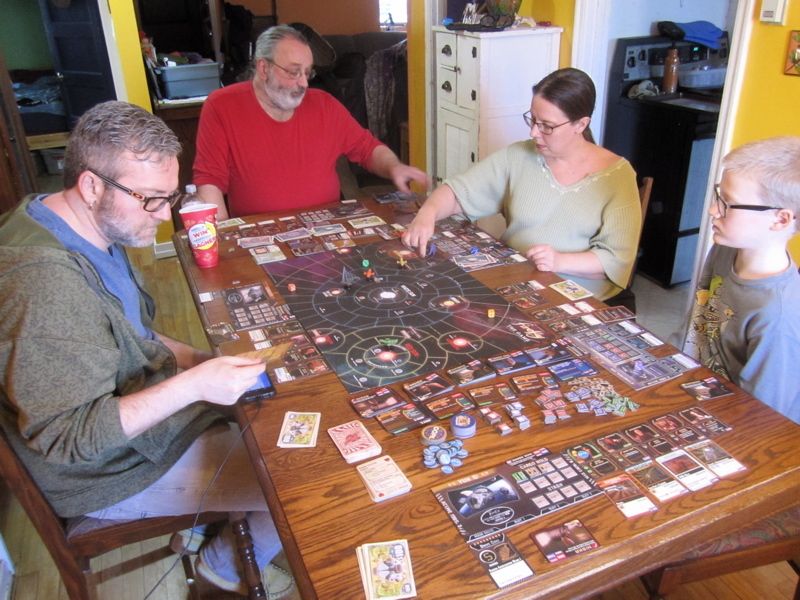 Saturday, 11 February, Bruce, Adele, and Jasper joined me and Finnegan for a game of Firefly. We actually finally finished a 5-player game in an afternoon – that wasn’t the “First Time in the Captain’s Chair” scenario. Of course we tried out the accelerated version (where you START the game with a bunch of crew and equipement). This time we played “King of All Londinium”. I think Bruce or Adele won. They’re, like, PROs at this game now. I wasn’t even close. I don’t think I even had my first goal token! But I still had a lot of fun playing. I could just faff around all day doing jobs, hiring crew, buying new equipment, and such. It’s sometimes hard to stay focused on the fact that there is a GOAL to the game. 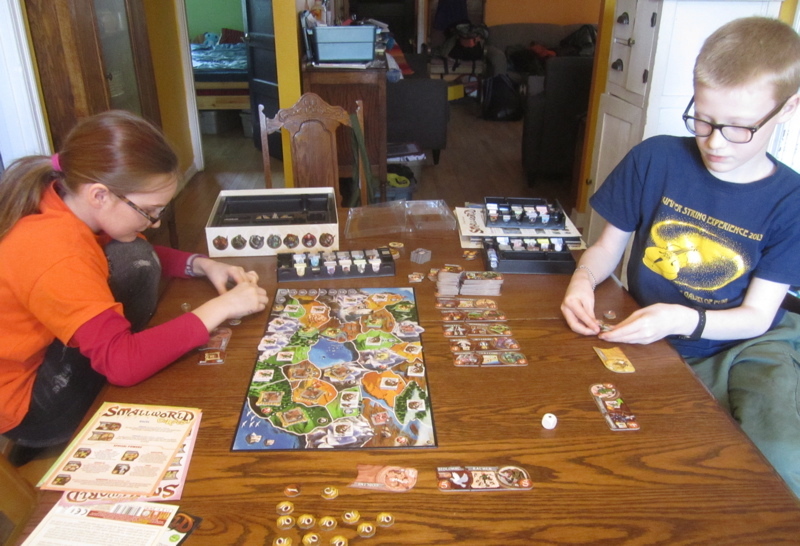 Wednesday, 15 February the kids and I played Small World. We haven’t played much Small World lately – Okay I played it at FreezerBurn in January… but before that…? 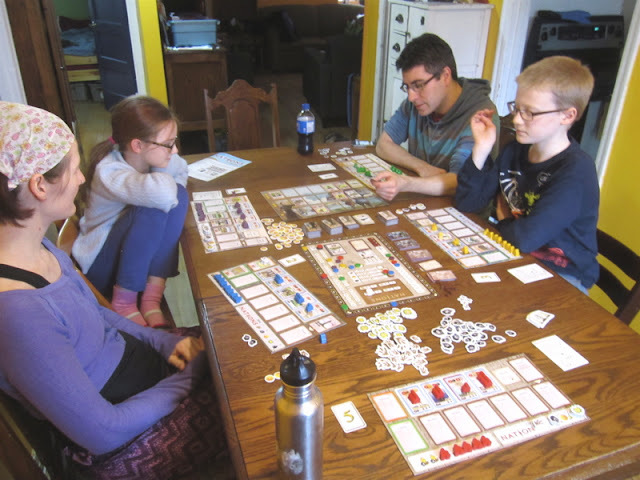 and I can’t remember playing on the 3-player board – I’m sure I have – probably when I first got it I played it once or twoice with just the kids – but usually we end up playing with 4-5 players. 18-20 February was the Family Day long weekend in Saskatchewan this year. So I planed a weekend of family gaming fun! 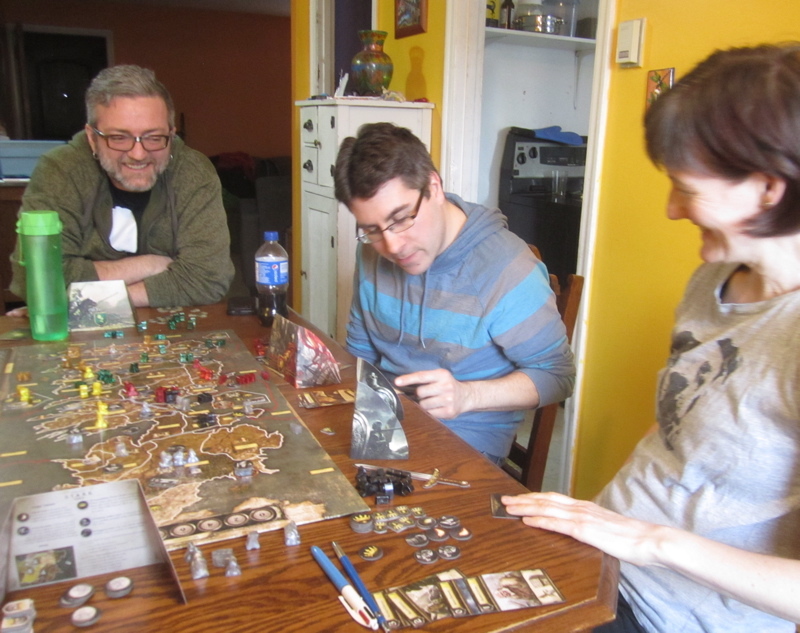 Saturday afternoon we played A Game of Thrones: The Board Game (Second Edition). We played this almost exactly a year ago, either on the family say weekend or my birthday. This year Jasper and Kurits joined us. I ended up playing the Starks again. 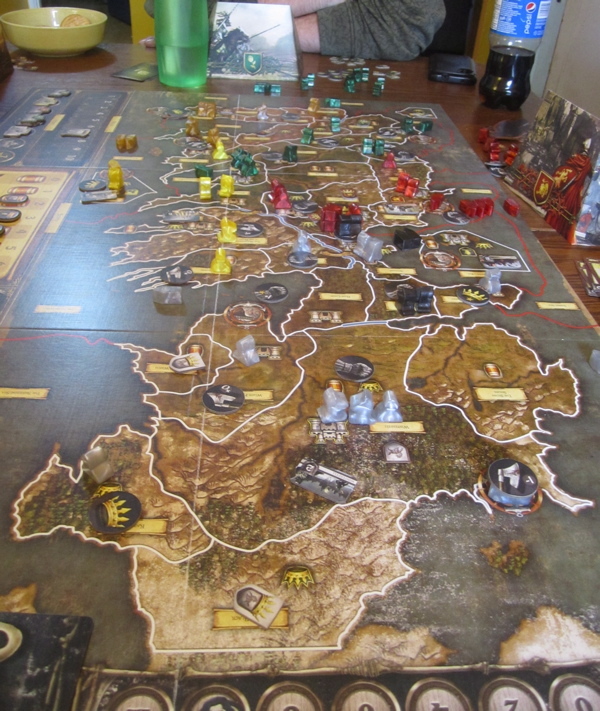 Amanda was the Greyjoys, Kurtis the Lanisters, The Girl played Dorn, Jasper the Tyrells, and Finnegan played Baratheon. It was okay. Jasper had to leave about two turns before the end. WE probably should have called it then, but I was winning at that point so I felt like calling it would have seemed like I was doing so because I was in the lead... No one else suggested it so we played on..
It’s kind of an odd game. The Greyjoys basically have NO chance at winning ever – sandwiched between Stark and Lannister. The best they can do is harass and annoy and make it hard for one (or BOTH) to get anywhere, which, really, is all they want according to the books? They want their own kingdom and they want to reave the shores of Westeros. 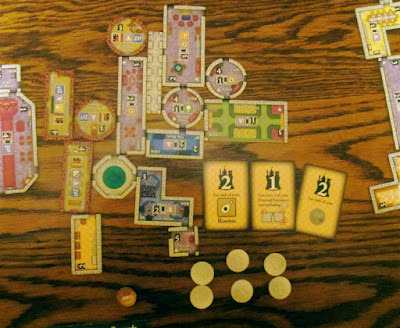 What care do they have for collecting castles – let along 7 or 8 of them – which is what you need to win the game!? Seems like maybe there should be separate victory conditions for the other houses. That’s pretty much all Amanda did all game with the Greyjoys – alternately attacked the Lanisters and Starks and got nowhere in return. I tired to make an alliance with her, but so did Kurtis (the Lanisters). I tried to point out that there was NO POINT in attacking me – as there were not enough castles in all the north for her to take over and win the game – her only hope was to go SOUTH and attack the Lanisters – which I was perfectly willing to help her do! Instead she just remained a thorn in both of our sides the whole damned game… I couldn’t get past the Neck. It didn’t help that they event cards just didn’t work out – there were hardly any supply cards - where supply was worked out – so most of the game I was stuck with my initial starting supply – which meant – even though I had captured enough areas with barrels (supply areas) that if supply had been worked out I would have been able to field more armies I was stuck being unable to concentrate my forces into more that two armies – which meant I had to spread any forces I gained out and was unable to make focused attacks. There were even a few muster cards where everyone else got new troops, but I couldn’t simply because the army/supply limits meant I could not put new guys in the castles where they mustered because there was already a unit there and a second unit makes an “army” and I already had my limit (of TWO!?) armies elsewhere!? So frustrating. SOOOOOO frustrating. 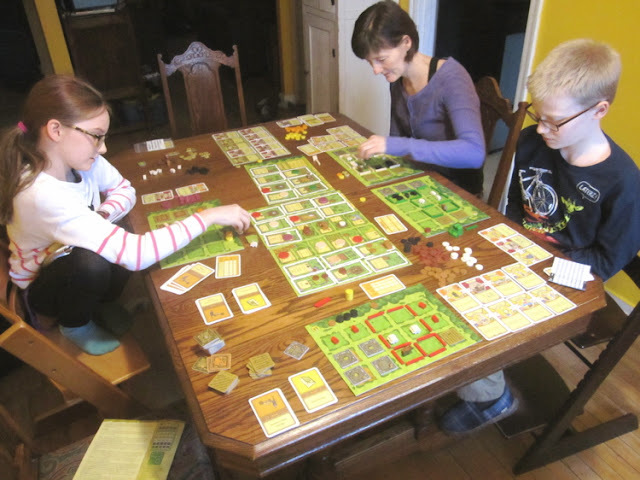 Sunday afternoon just the four of us played a game of Agricola. This was my sad little farm at the end. And she won with it. I think it’s an odd game too. It’s way easier to raise animals – I actually find it really hard to get more than a couple of areas ploughed and sowed with grains or vegetables. It’s because there is ONE spot to plough a field to start with – which ploughs one little section – but when you do the build fences action you can essentially cover half (or more!) of your land with fenced in pastures?! Or in one build sheds action you can build up to four sheds – occupying four areas – provided, in both cases, that you have sufficient wood. 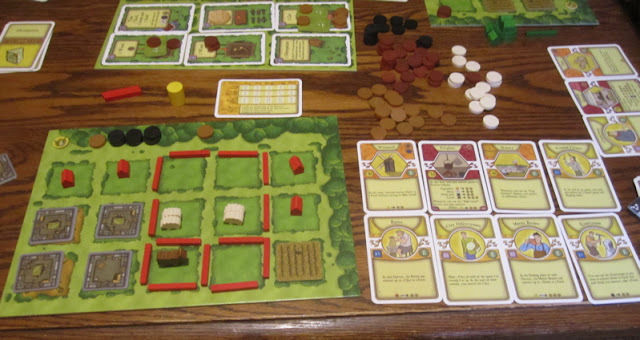 I mean, I like the game… I just wish there was more opportunity to plough fields and sow them! Finnegan played a ship/captain that was SUPER slow, but collected a LOT of junk – it looked like he was super far behind all game because he wasn’t scoring points for laps or for blasting away at other ships ( I had “lapped” him on the score track at one point – one hundred points ahead of him! ), but when we counted up points for junk collected he shot past all of us. Both of Sundays game had bee The Girl’s picks. 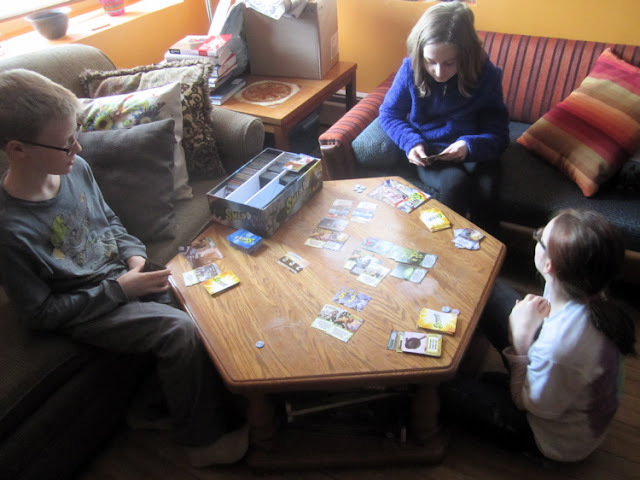 Monday (Family Day – a stat holiday in Seakatchewan), Kurtis joined us again for a game of Nations. I played China again. I am determined to win with them at some point – there has got to be a way (totally didn’t THIS time around)! 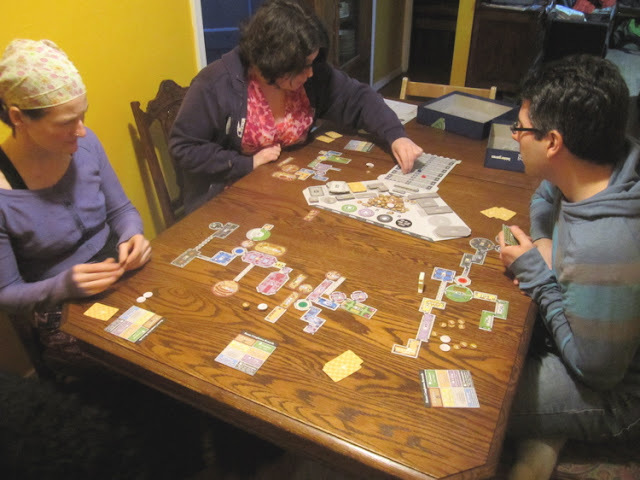 Amanda played Japan – which was really interesting (I’d like to try playing that sometime). I think it came from the expansion that Kurtis brought along. 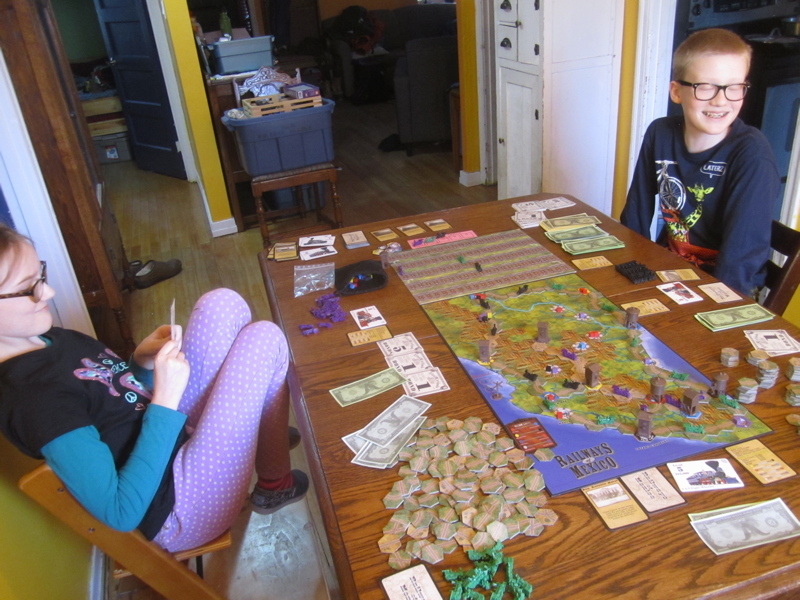 Kurtis and I played at Prince level, Amanda and the kids played at Chieftan (They got more resources during growth). 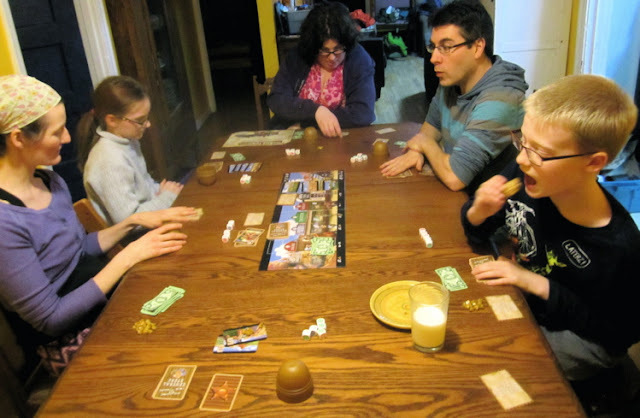 Later Kurtis’ wife Shannon joined us for supper (I made a GIANT vat of veggie chili) and then we played a few games they brought over. First we played Dicetown, which was pretty fun. The Kurtis, Shannon, Amanda and I played Castles of Mad King Ludwig. 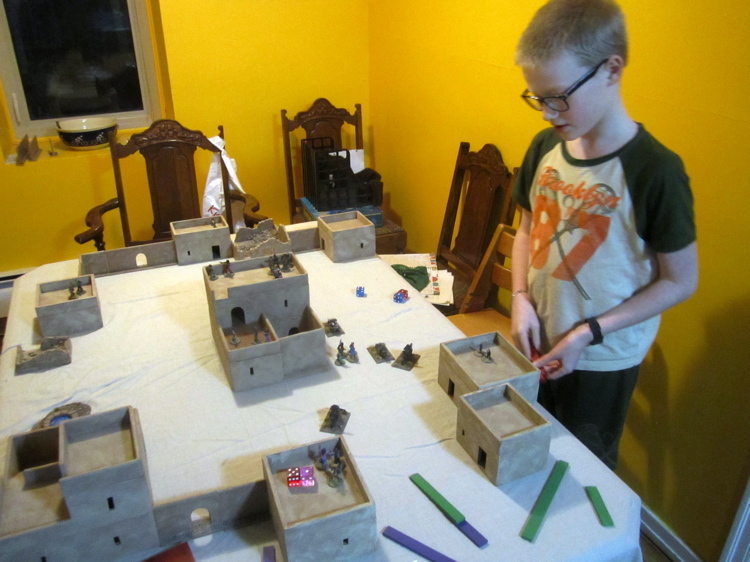 This was really fun – It tapped into that part of my brain where pre-teen Tim still resides designing and planning “dream homes” that are a bizarre cross between D&D dungeons, a mad scientists lair, a nuclear fallout shelter and homes of the rich and the shameless. I must play this again sometime. This was my little castle. I’ve been trying to cut back on the game-buying and maybe even try to pare down the collection a bit, but I might consider getting this game at some point. It is officially one the boardgame wish list. The following week was a school break so some of the kids friends came over to visit. Games were played. I didn’t play with them so I didn’t really keep track of them, but I took pictures of a couple. Friday was another D&D night for me and Amanda. This year with all the Vimy stuff going on, I didn’t think I really had time to plan and host any sort of bigger event so I invited people to come over and play one of the Pax games by Phil Eklund in the afternoon and some old school Illuminati in the evening (which I probably haven’t played in 15 years!). 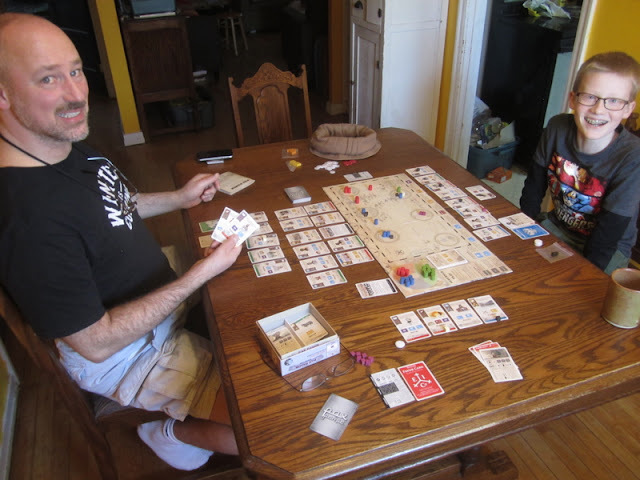 Brent showed up to play Pax Pamir with me and Finnegan in the afternoon. 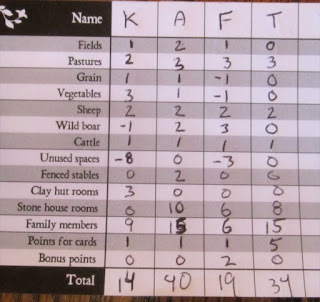 I tried playing this once with the kids about a year ago. 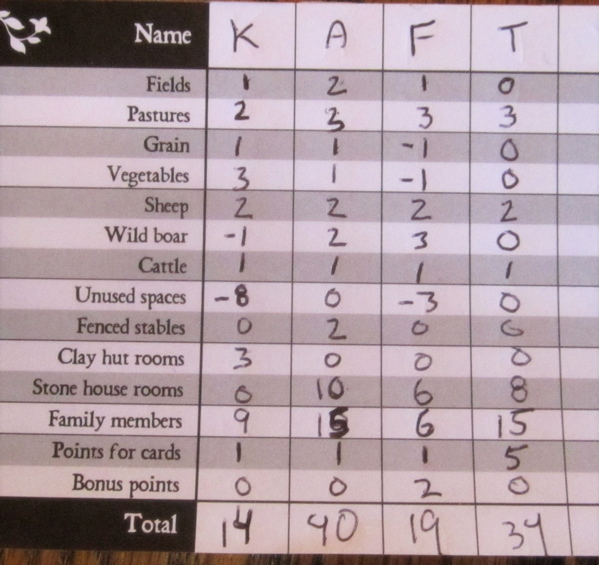 I have since played Pax Porfiriana a few times, but hadn’t had another stab at Pax Pamir. I'd REALLY like to try tout with 4-5 players. Both games we happened to each be allied with a different empire (British, Russian, or Afghan) which meant that favour didn't really play into it all that much - as if one of those empires gained supremacy, whoever was aligned with it would win. It would be interesting to see a game where more that one player was aligned with of or more of the empires and they had to co-operate to get their empire into ascendancy, yet at the same time try to curry more favour with that empire than the others for the win when their empire gains supremacy. 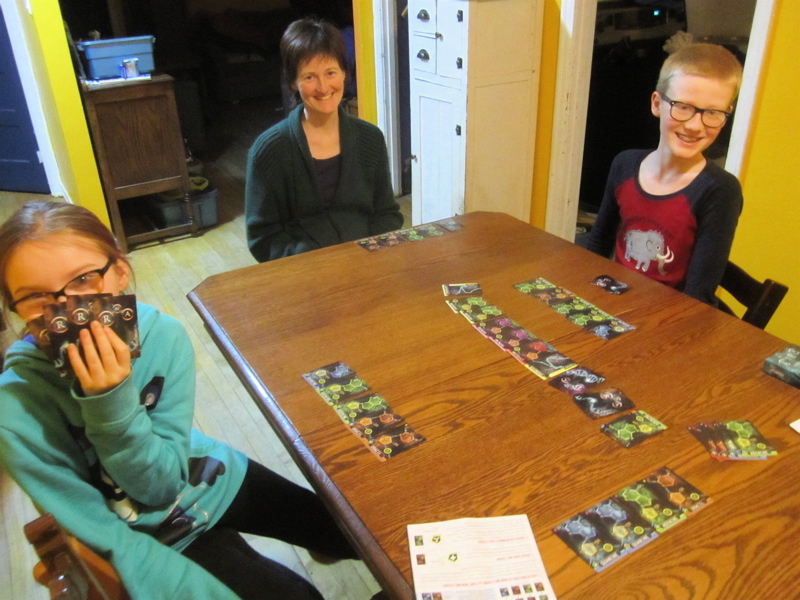 There were no takers for Illuminati, so after Amanda and The Girl got back from Dance classes we played a quick game of Race for the Galaxy, had supper and then watched a couple of movies (while I did some painting). I think we’ll probably lay off the gaming a bit through March a bit to give me chance to concentrate on the Vimy terrain building – which I really need to get cracking on!!! Another month chock full of gaming goodness! It was indeed! Thanks Gordon! That's an impressive amount of gaming! We (me and the Girl) spent the weekend at a gaming con. Great fu that and we tried out five new games and I went and bought one of them (Star Realms) as a birthday present to myself. Opened it up a few day early and we had 10 (!) games of it today. Great fun. 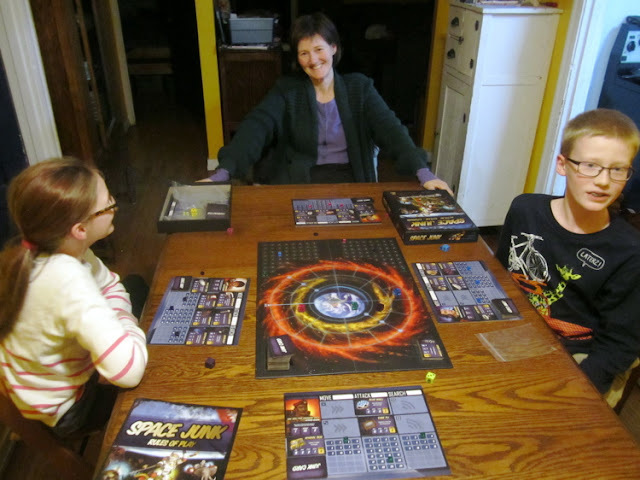 Star Realms is fun! 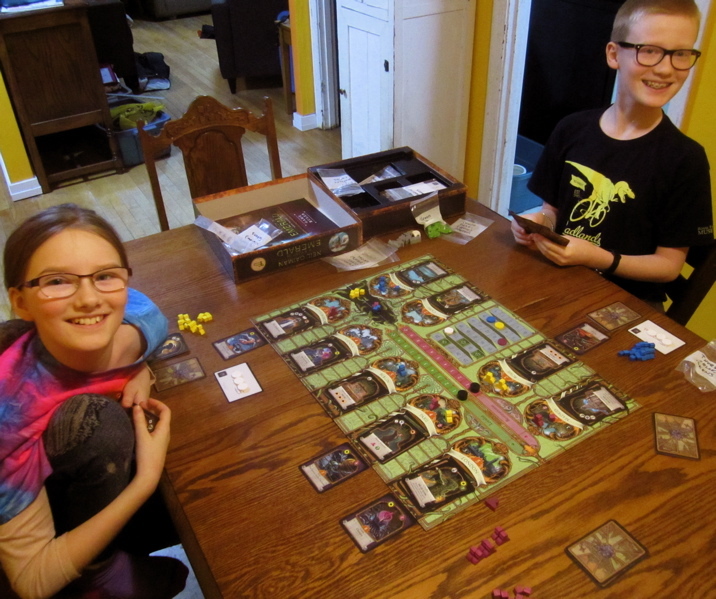 A Friend brought it over to play with me and the kids a year ago when he heard we were playing Legendary (the Marvel Superheroes deck-building game) because they have very similar mechanics. 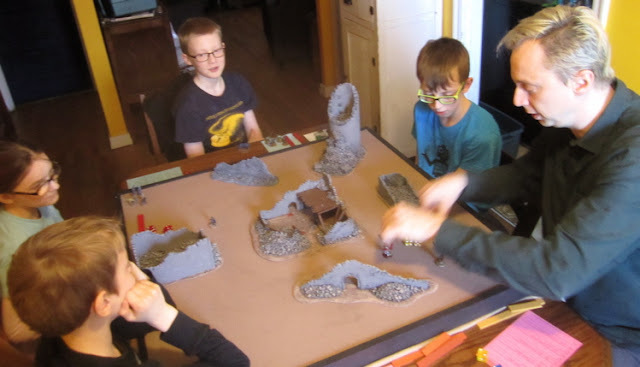 The kids weren't really taken with it at the time and we forgot about it until our own local gaming convention (ToonCon) last September. 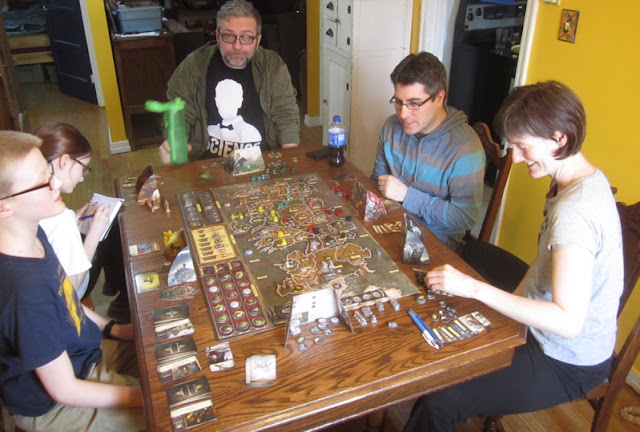 Amanda, myself and the girl all signed up for it because there was little else we were interested at that time (I think Finnegan was playing Tzolk'in: The Mayan Calendar) and we all had a lot of fun playing it - so we headed over to our local game store and picked it up. There was a couple other games we played over the weekend that we probably would have picked up right then and there as well, but they were out of stock at the time (Castles of Burgundy, Stone Age, and Five Tribes). 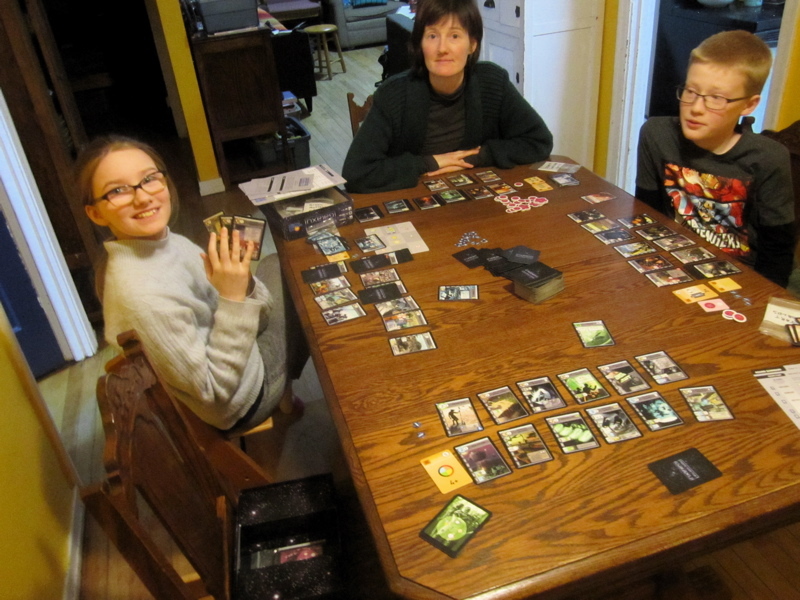 I think one of the episodes of Tabletop season 4 is on Star Realms - at least that will be ONE episode we can watch without the kids begging me afterwards - "CAN WE GET IT!? CAN WE GET IT!?!!!"